Standing back from the main road, the Hôtel Cyrnéa is a comfortable hotel close to the fabulous beach of Calvi and its facilities. 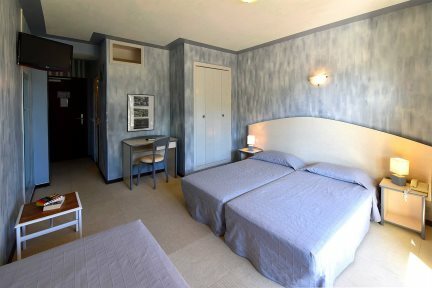 Standing back slightly from the coastal road, Hôtel Cyrnéa is a simple but comfortable hotel on the outskirts of Calvi. The charming and very helpful owners, the Peretti family, will do all they can to ensure guests are rested and relaxed. The fabulous beach is within walking distance through the pine trees, and there is a large pool within the pretty, spacious grounds for your enjoyment. Breakfast can be served on the terrace and there is a bar lounge with television. Rooms are simply appointed with en-suite facilities, television and a balcony (first and second floors only) – and there is a supplement for air-conditioned rooms positioned at the front of the hotel overlooking the pool. Most of our guests enjoy a gentle stroll into town in the evening and although return airport transfers are included, some guests may wish to consider hiring a car to explore further afield. Hôtel Cyrnéa provides good value for money accommodation and is a perfect base for discovering the delights of Calvi and la Balagne area. Swimming pool (13m x 6m, max depth 1.9m), parking, bar-lounge, breakfast terrace, Wi-Fi, lift. En-suite shower room and wc, television, telephone, air-conditioning. A standard double bedded room with air-conditioning and a pool view. A standard twin bedded room with air-conditioning and a pool view.